Currently browsing posts filed under "Veterans Admissions"
During the war, V -12 programs were on campus and a few years later, the presence of returning vets was common. A full complement of officers and enlisted men were assigned to Williams to serve as the faculty. The appearance of a veteran on campus would not be new. I hope the appearance would be welcome. 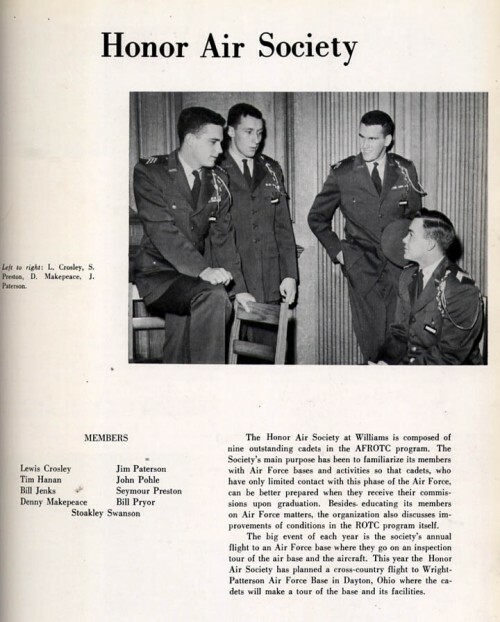 ROTC was an important part of a Williams education for 10% of the Class of 1956. Click MORE (below) to see the AF faculty. I knew Captain Taylor, a fine man and a graduate of the USNA. The country will benefit by having ROTC again recruiting at the nation’s top universities. ROTC graduates constitute 56 percent of Army officers, 41 percent of Air Force officers, 20 percent of Navy officers and 11 percent of Marine Corps officers, according to the Office of the Under Secretary of Defense. The legislation repealing “don’t ask, don’t tell” gave a not-so-gentle push with the inclusion of a provision requiring a report to Congress on the enforcement of the law that prohibits federal funds to colleges that block ROTC units. 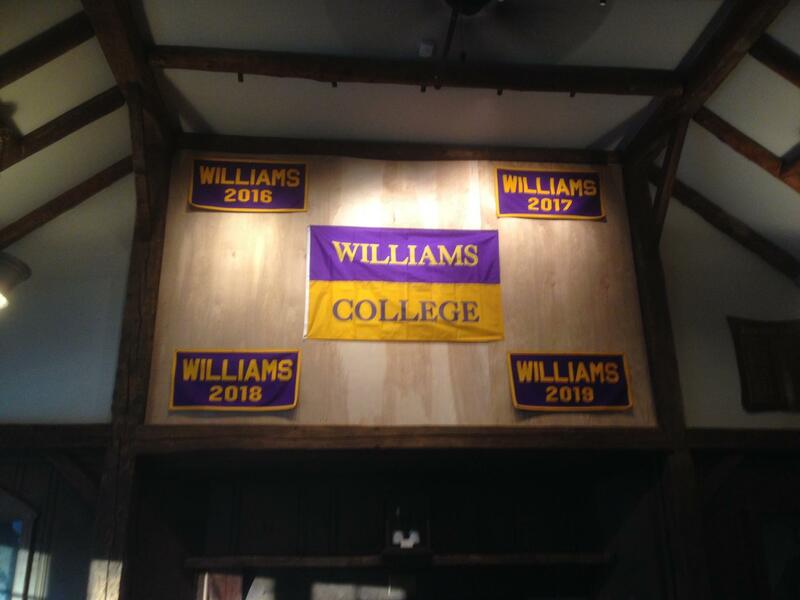 How Many Veterans Apply to Williams? Sloane’s proposal stems from his second annual survey of undergraduate veteran enrollment at elite schools. The numbers are, as he says, “disgraceful.” Princeton and Williams had no veterans among their undergraduates; Yale and Harvard, only two. Dartmouth and Stanford led the pack among the elites, with 12 and 21 veteran undergrads, respectively. I’d be curious how Tilghman would regard such reasoning from a president of, say, a Fortune 500 company with no female board members or a university sciences department with no female faculty? 1) Shirley Tilghman deserves credit for responding to Wick. Did Adam Falk? 2) The key difference is that there are many women apply to, say, science departments at Williams with, objectively, credentials that are equivalent to those of the male applicants. I doubt that the biology department, for example, provides any meaningful affirmative action for women seeking faculty positions. Moreover, there are similar numbers of men and women in the applicant pool. But I think that the situation is very different when it comes to US veteran applicants to Williams. I think that very, very few US veterans apply to Williams and that, in general, those that do have academic credentials (mainly high school grades and standardized test scores) which are much lower than other applicants. So Williams (correctly, in my view) rejects them. Does anyone know the details of applicants to Williams from US veterans? Comments Off on How Many Veterans Apply to Williams? “We are talking to marine corps veterans as part of [our] leadership scholar program,” said Nesbitt. The program is at a discussion stage and is being developed to help identify high ability veterans interested in a liberal arts college. Although no agreement has been signed yet, this structured approach to identifying the “right fit” veterans would go a long way in ensuring that they stay in the classrooms even after the first quarter. If adopted by other schools, this approach could lead to a healthy veteran community in colleges like Princeton or Harvard. Bowdoin Student Government requests that the Office of Admissions actively recruit academically qualified veterans beginning with the Class of 2016, with the aim of having a few such students in each matriculating class. The Office of Admissions is under pressure to meet the demands of many constituencies on campus; BSG recognizes this, and submits that it is nonetheless a priority to bring a few veterans to campus. 1.) Veterans have experiences, ideas, and perspectives that no other types of students do. They would contribute to the intellectual vitality and diversity of the College, enhancing the academic experience of students and faculty alike. 2.) There are among the men and women returning from Iraq and Afghanistan some of the future leaders of our country, and these are people whom we want to have Bowdoin degrees. The College’s own commitment to the Common Good makes us particularly aware of the sacrifices made by those who have served our country. 3.) The College’s commitment to recruiting the best students in America should not be restricted to 18-year-olds who are seniors in high school. 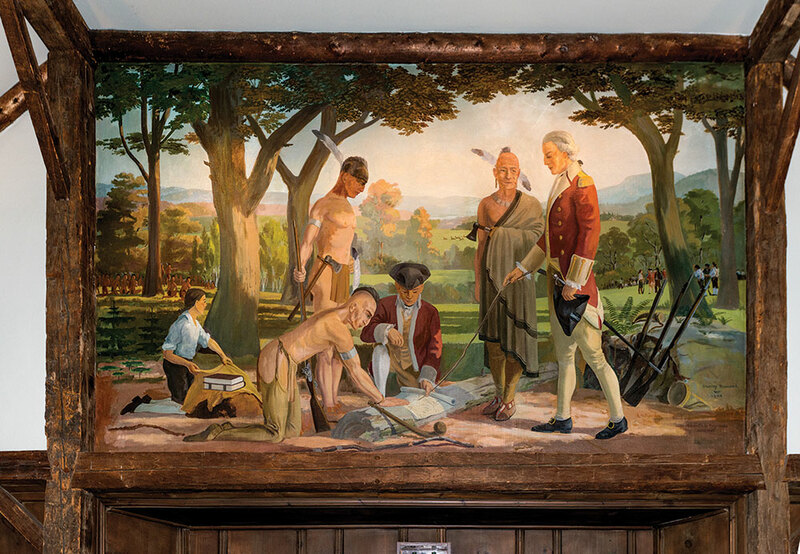 We recognize that there is more than one path to Bowdoin, and that participation in the armed forces should not preclude talented students from being recruited and admitted. 4.) The Bowdoin community has long had a warm relationship with the armed forces. Many recent graduates have become officers, two recent high-profile alums attended Bowdoin after serving (Wil Smith ’00 and Alex Cornell de Houx ’06), and the Naval Air Station in Brunswick has made this community welcoming towards veterans. 5.) The new Yellow Ribbon Program makes bringing veterans to Bowdoin a financially-positive proposition. With the U.S. Department of Veterans Affairs (VA) providing a housing stipend, a contribution based on the tuition at the University of Maine—Orono, and matching funds for Bowdoin grants, veterans can afford the College, and Bowdoin can afford them. 6.) This policy is not unprecedented; Stanford, Dartmouth and the College of William and Mary have recently been recruiting and admitting veterans as undergraduates. Students and faculty at these institutions have been very supportive of the veterans on their campuses. And while some veterans need additional support services, these expenses are easily covered by the financial support conferred by the Yellow Ribbon Program. George Aumoithe ’11, Rory Brinkmann ’11, Sean Campos ’11, Caitlin Callahan ’11, Nick Daniels ’12, Amanda Gartside ’12, Oluwatobi Olasunkanmi ’12, and Steve Robinson ’11. In an effort to move the conversation away from the presumption that Military Veterans would need special considerations, I would like to point out that our armed forces currently has well over 1000% more Ephs than Williams has veterans (0). If the Military is smart enough to recruit and enlist Ephs, as well as put some Ephs into Officer Programs- why can’t Williams find some valid candidates? No special consideration is needed. Although I do believe, ten years into a global war, Williams and other schools like it should house officer programs for qualified enlisted members. The absence of Iraq and Afghanistan veterans at Williams is disgraceful. I’ve brought this to your attention before, without result. Hammering me, the messenger, is petty. I’m long dead, anyway, but fire away if that makes you feel better. There are now hundreds of thousands of veterans collecting GI Bill benefits. Williams can find a few. Any and all of you are welcome to visit any class of mine at Bunker Hill Community College. I will give you the entire period to rebut my argument that Williams should have veterans enrolled. I find no pleasure in this broadcast note. I’ve tried the polite way for more than a year with no luck or even credible replies. Cane. Short haircut. Young. Here in a community college, that means “Veteran. Wounded.” I always introduce myself to see what help they need at school. Or perhaps what help I need, because I am so ashamed of what I, the people, have put these veterans through with little result or purpose. One cane I’ll call Tony I’ve lost altogether. He wasn’t thirty years old. An improvised explosive devise, an IED, in Iraq had caused his wounds, he told me. Brain trauma, which showed in his speech and thinking. The limp was because the IED had broken his neck. In the fog of war, no one had discovered the fracture until he was in a hospital in Germany. Just the effort of walking left him sweating in the lobby. He had his veterans benefits paperwork. A colleague and I made sure he had what he needed and knew the right lines to register. I looked two days later. Tony wasn’t registered. I telephoned. He’d been mugged on the subway. I talked with his father. I offered to drive over and pick Tony up. We couldn’t get Tony back to school. He only wanted to go to community college for job training. Another cane is still in school. My best writing on veteran issues are here, here and here. Happy Veteran’s Day to Ephs far and wide. 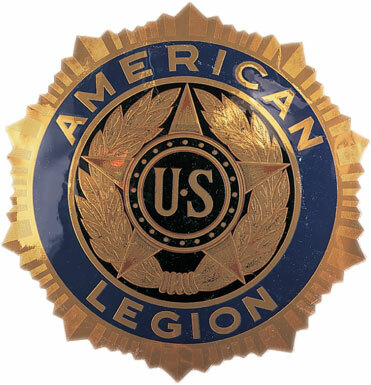 ‘A one hundred percent Americanism; ‘To preserve the memories and incidents ‘Of our associations in the Great Wars; ‘To inculcate a sense of individual obligation‘To the community, state and nation; ‘To combat the autocracy‘Of both the classes and the masses; ‘To make right the master of might; ‘To promote peace and good will on Earth; ‘To safeguard and transmit to posterity ‘The principles of Justice, Freedom and Democracy; ‘To consecrate and sanctify our comradeship ‘By our devotion to mutual helpfulness; ‘To all of which I pledge myself ‘For God and Country. ‘I am not a member and do not subscribe ‘To the principles of any group ‘Opposed to our form of government. Have a great homecoming everyone. Former Williams proffessor Marc Lynch makes the following observation (in the below post) when confronted with the shunning of military Veterans by Americas academic elite. I’ve had a few soldiers interested in pursuing degrees ask me nervously whether they would be shunned by academics. I would be shocked if any experienced prejudice or bias because of their war service — certainly not at a place like GWU — and would be appalled if they did. Sir yes sir. As mentioned by JeffZ, Don’t Ask Don’t Tell is the reason given for banning all military activity on many college campuses. A ban of active members of the veterans community from even existing on campus because of a government policy. Who else should we ban? Not the Taliban, just Marines? It is very thinly veiled- where these schools biases and prejudices lie. No doubt, it could be damn uncomfortable for veterans to go to a college where recruiting and involvement in such service is strictly prohibited and protested. Colleges should lift all bans on ROTC now. Such discrimination should no longer be tolerated. Support our military. Fill it full of the best educated minds in the nation. As David always says “Indeed.” It is important to note, that a lot of these bans took place during the Vietnam war, and had nothing to do with “Don’t ask don’t tell”. On the previous thread Larry states that perhaps Williams offered $5,000 annual matching funds as a place holder on an application? On second glance… perhaps not. Perhaps the school took the time to understand the full benefit of the program before they came up with a number to fund the cost? 1. Cost of tuition and fees, not to exceed the most expensive in-state undergraduate tuition at a public institution of higher learning in the state you are attending school. 2. Matching funds for yellow ribbon. 3. Monthly housing allowance equal to the basic allowance for housing. payable to an E-5 with dependents, in the same zip code as the school. 4. Yearly books and supplies stipend of up to $1,000 per year. Here are the rules. Perhaps 5k is all that is needed to match to pay for just about everything? What is the “most expensive-in state undergraduate tuition rate at a public institution of higher learning with fees” in MA? $5,939.50 per term. So… we do the Math for annual amount. 5939.50 X 2 + 5,000 from Williams plus 5,000 matching funds- Means qualifying veterans would receive 21,879 per year, for the cost of credits/fees. plus E-5 Basic Allowance for Housing (BAH) with dependents for housing and living costs (12 X BAH of 1416), plus 1,000 for books. 21,879 plus (12X 1416) pus 1000= $39,871.00 annual benefit. What is the annual cost for Williams again? 5k for a full ride? It’s a no brainer. Amherst participates in the Yellow Ribbon Program. Why doesn’t Williams? More background here. The deadline for colleges to sign up as Yellow Ribbon institutions has been extended from May 15 to June 15 – and it’s a good thing, too, as many colleges are still grappling with the program’s many complexities. Numerous private colleges — large and small, internationally-known and regional, near and far from military bases — are signing up, even as others hold back. Under the new, Post-9/11 GI Bill, and the Yellow Ribbon Program specifically, colleges can enter into dollar-for-dollar matching agreements with the U.S. Department of Veterans Affairs to cover any outstanding tuition and fees above those covered by the base GI Bill benefit, which varies widely across the nation because it is pegged to the highest resident, undergraduate public university charges in each state. Private colleges can enter into Yellow Ribbon agreements to cover all or part of the difference between the base benefit and their charges for up to a specified number of students, but so too can public colleges enter into Yellow Ribbon agreements, to cover the balance for non-resident veterans or those enrolled in more costly graduate programs, like law or business. Amherst also deserves kudos for its special scholarship program for veterans. Amherst College has created a permanently endowed scholarship fund for veterans of the U.S. armed forces who are accepted by and enroll at the liberal arts school. The Veterans Scholarship Fund, as it is called, will provide enough financial aid to cover the full demonstrated need of qualified former American servicemen and servicewomen, starting in the fall of 2009. Surely there is at least one trustee at Williams who feels the same as LeFrak . . . In times of economic troubles, I would not expect the College to start a new scholarship, at least in the absence of a specific donation. But why not participate in the Yellow Ribbon program? By the way, how many veterans are in the class of 2013? Probably no more than a handful, and all of those international students. When was the last time that Williams admitted a US veteran? I have never heard of one. EphBlog is powered by WordPress and delivered to you in 1.521 seconds using 44 queries..